Even blacksmiths’ tongs are now manufactured and sold to the smith, but all older smiths prefer to make their own tongs. Every apprentice should experiment some in making tongs, for it is a good exercise in learning the trade. To make a small pair of tongs, take 3/4-inch square Swede iron. 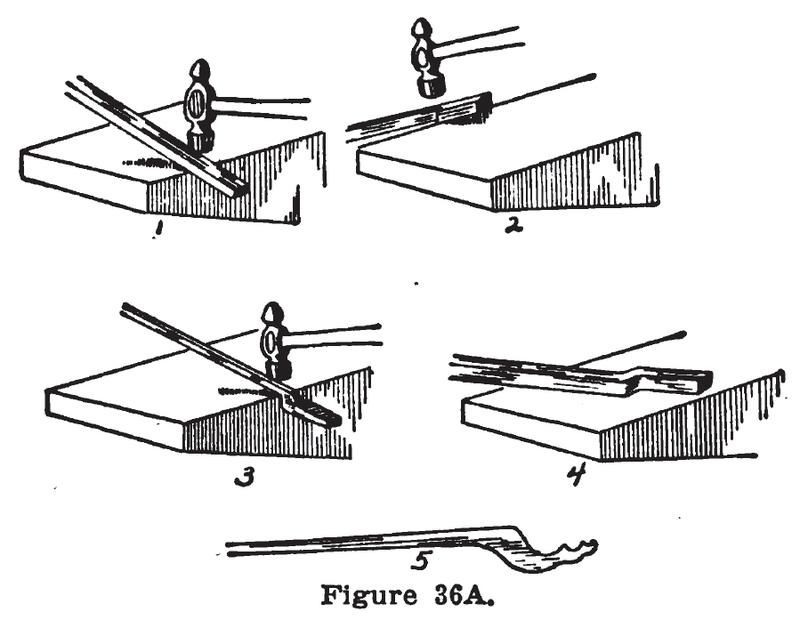 Place the bar diagonally over the anvil, with the end sticking outside the outer edge of the anvil about two inches, and strike with the hammer in such a manner that the center of the hammer comes down over the edge of the anvil. 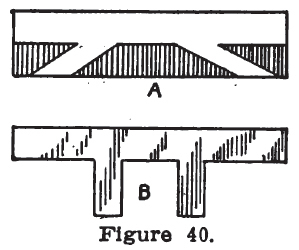 This will make the edge of the anvil cut into the bar, and forge the first shoulder, as shown in 1, Fig. 36A. The next move, place the bar on the inner side of the anvil up against the shoulder made in the first move, but the inside, that was down in the first step, must now be on the left side of the iron. Then strike in the same manner, and the edge of the anvil will make another shoulder. See 2, Fig. 36A. Next put the iron back over the outer side of the anvil,—the side that was down in the second step must now be up,—and then strike as before. See 3, Fig. 36A. This makes three steps, and they can easily be made in one heat, when one gets used to it. If a pair of tongs with big jaws is wanted, bend the iron first as shown in No. 4, Fig. 36A, and then proceed as before. Both jaws should be made alike; for when they are put together, one is turned down and the other up, so you must therefore make them alike. They should also be made as described for right-hand tongs. By a right-hand tongs is generally meant a tongs to be held in the left hand, and when held in the left hand the lower shank is on the side next to the body; left-handed tongs the reverse. The jaws in a pair of tongs should be grooved, for they will hold better if they are. 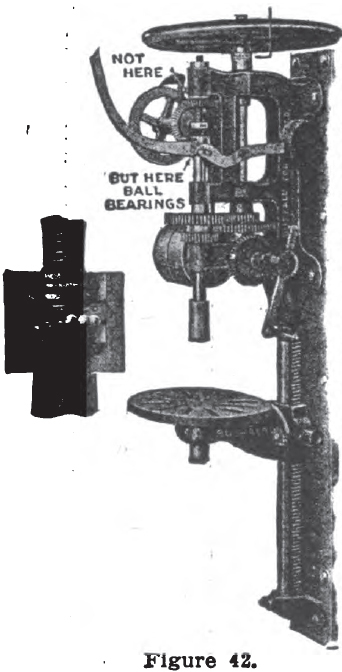 The groove can be made by placing a piece of round iron in the jaw while the jaw is hot; and strike so that the round iron will embed itself in the jaw. Thus a groove of the size in proportion to the tongs can be made. This groove will give a better grip to the tongs, and it will hold round iron solid, which is difficult with a pair of tongs with smooth jaws. When one hole for the rivet has been punched, place that jaw on top of the other, and mark the hole. When the holes are both punched, cool the tongs off, and put in a hot rivet. You will now find that the tongs are rigid and cannot be opened; and to explain the next step, nothing can be said that will explain it better than to tell a good little story of an apprentice in the good old times when the guilds held the sway: The apprentice had the tongs made and riveted, and found to his horror that they could not be moved. He then stuck them under the bellows, for he didn’t want his master to know that he was puzzled. At the supper table, the apprentice told the story he had heard about an apprentice who, when he had made a pair of tongs, threw them away because he could not move the jaws after they were riveted together. “Oh, such a fool,” said the smith; “why didn’t he heat them.” The next time our apprentice was alone he pulled out his tongs, made them red hot, and they could be worked easily. S-wrenches are the most convenient wrenches in a shop. To make one, take a bar of tool steel 1/2 or 3/4 inch. Place the bar edgewise over the bottom fuller, and the top fuller on the top side. Have the helper strike while the shoulders are made. Next draw out the stock toward the center of the material. See A, Fig. 37. The next step is to round the end up over the edge of the anvil. Then punch a little hole in the bottom of the jaw, and cut out with the chisel, as shown in B, Fig. 37. If there is enough stock, you may cut out as indicated by the dotted line. Then finish as shown by C. This makes one end of the S-wrench. The other end is bent in the opposite direction, and the jaw should be of a different size. These are the best wrenches. Do not harden. then drive in a punch that will swell it out as shown in B, Fig. 38. It is safest to first punch a little hole at each end of the split, for otherwise the split may keep on splitting further than is wanted. This is especially the case when the material is American iron. Fig. 39 shows another kind of split work. If a cross-shaped piece is wanted, split as shown in A, and work out to a cross, as shown in B. Fig. 40 is still another kind. In this, cut out the shaded parts as shown in A, and work out to the shape shown in B. These examples are enough, because it will give the idea how to work it out in almost any shape desired. Fig. 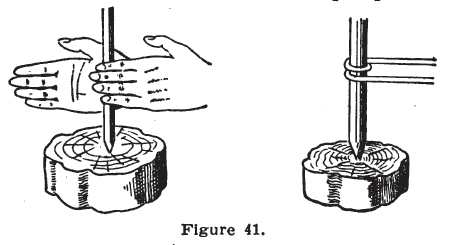 41 shows the method and the drill as used by primitive man. This is the prototype of man. Fig. 42 shows how the drill has been perfected by Buffalo Forge Co., Buffalo, N. Y. This drill is both for hand and power; as it is ball-bearing it runs easily, and has many advantages over the old-style drills. Drilling iron is comparatively easy, if the drill is right. It is important, in order to get a round hole, to have a drill which has the point in the center, and the shares should be of the same length and angle. We often make our own drills, but for more accurate and easy work I would suggest the use of drills and bits as well as reamers, as shown in Fig. 44, manufactured by Cleveland Twist Drill Co., Cleveland, Ohio. 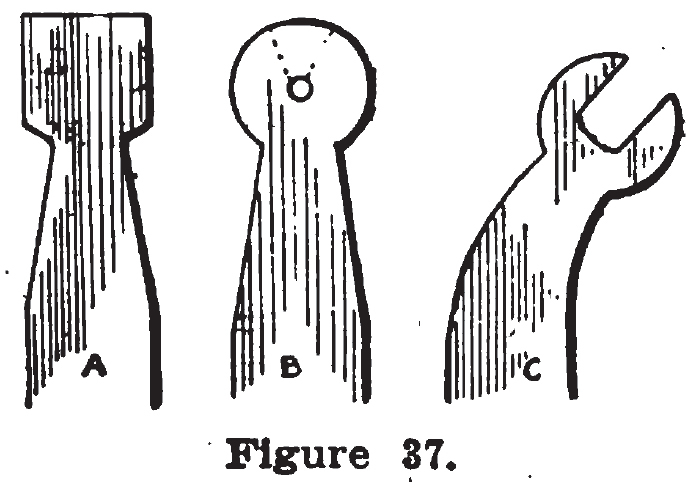 A shows for drill for iron and steel, B is for wood, and C is a reamer to reamer out holes which have been made too small. D is for iron or wood. E is for wood only. In drilling cast iron, no oil is needed on the drill; but in common iron, oil should be used freely to prevent the drill from getting hot. In drilling hardened steel, turpentine or water should be used, for oil will, to a certain extent, prevent cutting. The feed should be steady, for if the chip goes out, it is difficult to start it again in a hardened piece. 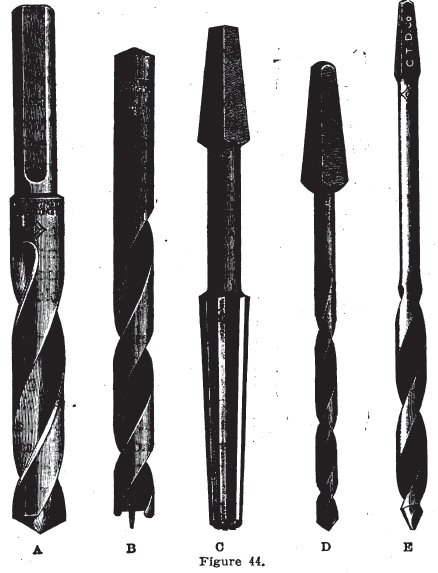 The feed should not be too strong when a light drill is used, and when the drill is about to penetrate with the point through the iron, it generally cuts in too deep, and the drill breaks; therefore it is safest, with any size drill, to slacken the speed when about ready to go through.